With Carl Hegelin out of the picture for next season, the Rangers need to reach to the youth to help fill out the depth spots on the roster. Oscar Lindberg deserves a promotion next season. Photo courtesy of MSG Photos. As fans and spectators of the game, it’s often hard to remember that hockey is a business. We grow attached to our favorite players that play hard and represent the Rangers well, only to see them traded away or lost in free agency. Carl Hagelin was “a great Ranger” as Assistant GM Jeff Gorton said. He was a Rangers draft pick in the sixth round, and impressed as a rookie, with 14 goals and 24 assists in his first 64 NHL games. His lightning speed was fun to watch, and he was an excellent defensive player that added depth to the lineup. Now I’m not saying that the Rangers’ didn’t lose depth or that they’re a better team after the trade. That remains to be seen. But when looking at what Glen Sather got in return as well as some other factors, the team could afford to make this decision. 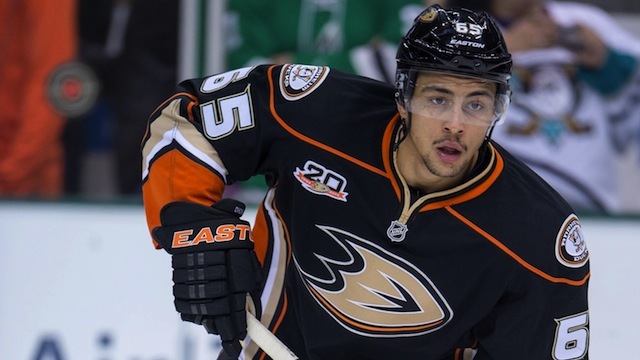 In exchange for Hagelin, the Rangers got Emerson Etem back from the Anaheim Ducks. Etem is a former first round pick (29) and a junior hockey standout. Just 23 and a pending RFA, Etem will be much cheaper option that Hagelin would have been. For a team severely pressed up against the cap, that’s very important. Etem was an elite player in juniors and in the AHL, with a high ceiling and loads of talent. His final year with the Medicine Hat Tigers saw him score 61 goals with 46 assists in just 65 games, adding seven goals in seven playoff games. In his last 72 AHL games, he has a total of 75 points. The talent is there, and he just needs a legitimate chance to prove that at the AHL level. When looking at the stat sheet, it seems as if Etem hasn’t been the NHL caliber the Ducks expected him to be, posting just 31 points in 112 contests with the Ducks. However, his situation can be compared with another Rangers’ forward, JT Miller. In 114 NHL games, versatile winger JT Miller has tallied 33 points. Many people would view that as minimal, or lackluster, but Rangers fans saw just what he could do when given a chance. The consensus is that Etem was never given a fair shot at maintaining his spot in the lineup with the Ducks. And when he did get playing time, he was usually thrown on the bottom line, just like how Miller was thrown in the doghouse in New York for a while. But with the guidance of Vigneault, and a chance to earn solid third line minutes, Miller blossomed with increased playing time, including an eight point playoff performance. Perhaps the same could happen with Etem. Emerson is bigger than Hagelin (6’1”, 210 lbs), he’s quick, and has great hands and a strong wrist shot. A change of scenery, a new system and a better chance at playing time could be exactly what he needs to reach his full potential. He was an elite scorer in junior hockey, showing that in the AHL, and I think he can get back to his roots while on the Rangers. Emerson Etem was in a similar situation to JT Miller while in Anaheim. Etem didn’t get significant playing time under Bruce Boudreau, but flourished in the AHL and in juniors. With more playing time and an increased role, Etem may reach his full potential. Photo courtesy of Jerome Miron/USA Today Sports. The Blueshirts also may have the answer in their own farm system. With Hagelin gone, Oscar Lindberg seems to have a really good shot at making the team out of training camp. 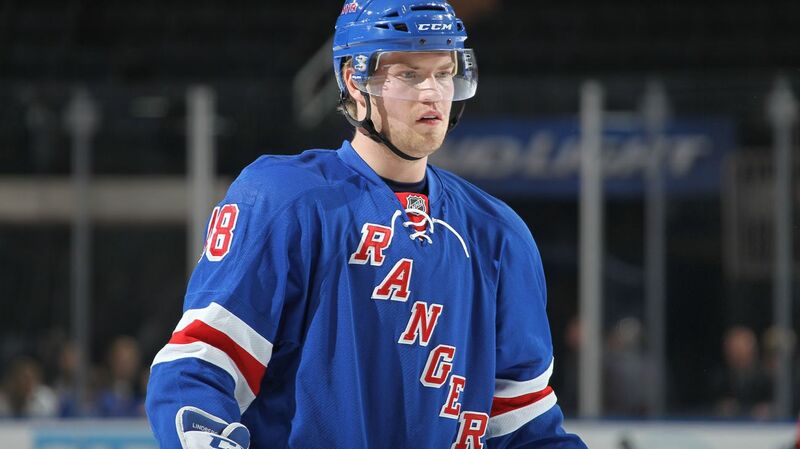 Lindberg, 23, made his NHL debut this past season, appearing in one game as the center on the third and fourth line. Formerly a Phoenix Coyotes draft pick, he flourished in the AHL this season, playing arguably the best hockey of his professional career. In 75 regular season games, he scored 56 points (28-28-56), adding another 16 points (3-13-16) in 15 playoff games. The Rangers were very patient and wise with the development of Lindberg, grooming him in Connecticut while they wait for an opportune time to bring him up. He’s been ready, the Rangers just haven’t needed him yet. There is a risk promoting an inexperienced player to replace a valuable depth guy like Hagelin, but it must be done in the cap era. Lindberg can skate well, will help the penalty kill, is great in the faceoff circle, and has good offensive ability. Not only can he pass, but he knows how to score goals as well. His high hockey IQ and work ethic will help him transition to the NHL. He’s younger, and the Rangers will have more control over his next contract. He’s currently slated to earn $750,000 next season. People have been saying that the Rangers need to get younger. Well, this upcoming season presents a perfect opportunity for the team to start giving more trust to the youth of the organization. Kevin Hayes will play a very big role, and Etem and Lindberg should as well. Posted on June 29, 2015, in In the Crease and tagged Carl Hagelin, Emerson Etem, Etem Rangers, Etem trade, Hagelin Ducks, Hagelin trade, Hartford Wolf Pack, Hockey, Ice Hockey, JT Miller, New York Rangers, New York Rangers blog, NHL Draft, NHL Draft trades, NHL Rumors, NY Rangers, Oscar Lindberg, Rangers, Rangers blog. Bookmark the permalink. Leave a comment.